When You Don’t Know What To Do, Do This! I often get women contacting me about coaching because they feel stuck. Sometimes the reason for the stuckness is very apparent; they may be looking to progress career wise and can’t see the next step, or feel thwarted by circumstance. Or they may have relationship problems with partners or colleagues, which is stalling their progress. Sometimes feeling ‘sticky’ is just part of the process of making change, and it’s OK for a while. And sometimes they can’t see a reason at all: they are just dissatisfied, and will often be apologetic and feel they should have it all under control. There are times when we have to live with a bit of stickiness until the message becomes clear. Try as we might, always being in control is not possible. Our subconscious knows something we haven’t yet figured out. We need to give it some time and space to surface. One thing I often advise my clients is to try to stop being so analytical and factual for a while and let their creative side out for a change. You may not feel that you have a creative side but you almost certainly do and this is one way of tapping into that wisdom within you. Take a sheet of plain paper and a pot of gorgeous crayons. 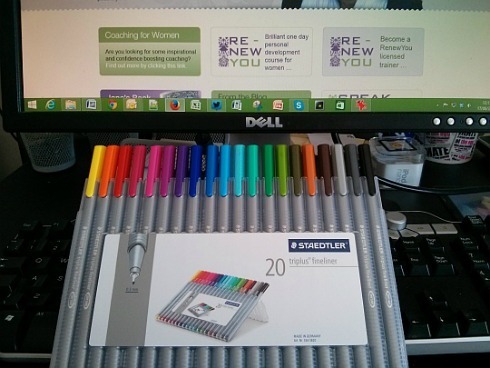 If you haven’t got any treat yourself to some: beautiful, bright, sensual, coloured pens. You can even try scented ones and tempt all your senses. Put paper and pens in front of you. Listen to the visualisation I mention below if you like, or take a few minutes to think about how you want to ‘feel’ on the other side of the ‘stickiness’. How would your best life look? Then pick up the crayons, put the pens to paper and see what happens. Try to stay in the moment and try not to use any words at all. It’s not an art competition or any kind of competition at all. It’s just a different way of getting to your inner wisdom. Allow the crayons to flow; you may have recognisable images, you may have conjured up a mood with colour. You will have something unique. Take a short break, have a drink, but don’t do anything else. Go back to your creation and imagine someone has asked you “Tell me about this”. In your head, try to tell them what were the thoughts going through your mind. This usually works best if you are really talking to a skilled person who can tease out the responses but a conversation with yourself is the next best thing, as long as you are honest and don’t apply a practical, realistic lens. This is about your hidden desires so don’t curtail them. You can always work out how to do it later. PS You might also want to listen to this free audio on my site. Visualisations are another way of tapping into our inner wisdom. Here’s the link: What’s Your Perfect Working Day? RenewYou is my one day inspirational course written just for women. Details of your nearest one are here. I’m a great believer in coloured pens and big sheets of paper. Never ceases to amaze me what can emerge from an exercise such as this. I know, it’s amazing, isn’t it? I too am a great believer in art/play as a medium to find yourself. I use coloured pens etc alongside collages in many of my training courses with foster carers to enable them to tap into their inner child and have fun..